We serve tapas in the Andalusian tradition as small complimentary accompaniment to in house beverages. Whenever possible we use seasonal and local ingredients and have committed ourselves to being a "zero waste" kitchen throwing away as little as possible. Usually, the tapas progression will start light and move to heavier and more complex tastes through each course. Traditional Tortilla Espanola: a potato, onion and egg cake, served with house made aioli and the a sauce of the day. Our take on the Southern classic, Pimento Cheese, made with Romesco and Manchego on freshly baked bread, served with house peanuts. 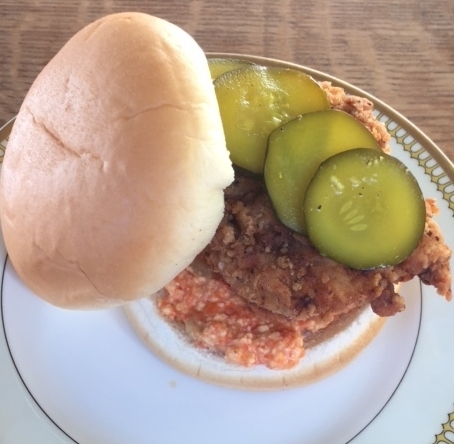 Cold Fried Chicken Sandwich with fixings.